← Seattle! We’re live Aug. 10th @ Columbia City Theater! 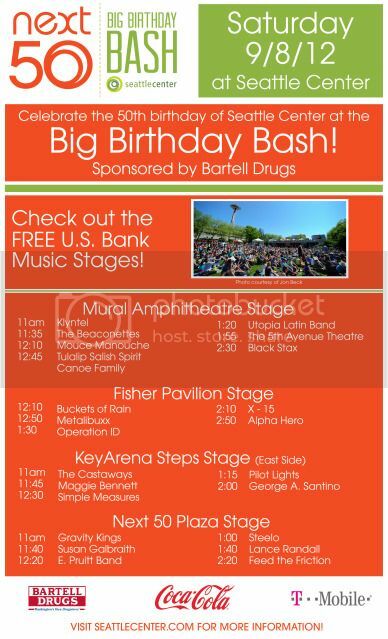 We’re performing live at the “Next 50 Big Birthday Bash” at Seattle Center on Sat. Sep. 8th, 2012. The all ages event is free and starts at 11am. Catch us at 1pm on the “Next 50 Plaza Stage.” Hit up www.seattlecenter.com or our FB page for more details. This entry was posted in Uncategorized and tagged Next 50 Big Birthday Bash, Next 50 Plaza Stage, Seattle Center, Steelo. Bookmark the permalink.